Hosted by McLaren Dallas, Allie Beth Allman & Associates, and Bella Custom Homes, the soiree featured craft cocktails such as the McLaren Mule made with Reyka Vodka, Ginger beer and lime juice, and the 720S Spider Smashes created with Hendrick’s Gin, cucumber and basil. Guest also enjoyed celebratory bites by TK Culinary. But it is clearly more than just a supercar. It is really a tale of two cars. Admittedly, it’s an incredibly fast supercar with phenomenal driver engagement. Slip it into “Sport” or “Track” mode, and hold on tight! But select “Comfort” mode and the 720S Spider transforms into a surprisingly comfortable daily driver. 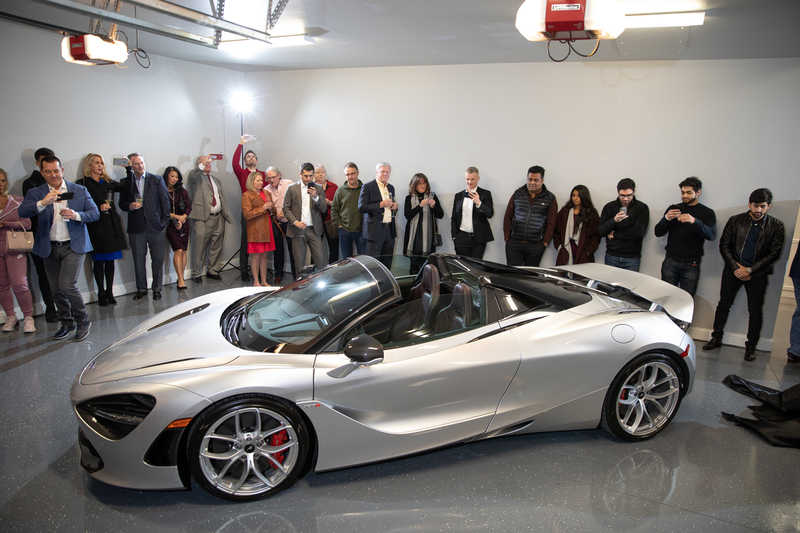 “McLaren’s deployment of generous innovations like this should rattle rivals five times its age, such as Ferrari, Porsche, and Lamborghini, and move the nine-year-old company in Woking, England, beyond its track-car roots,” proclaimed Bloomberg. Starting at $306,000, the 720S Spider shares the same twin-turbocharged 710-horsepower 4.0 Liter V-8 engine as its coupe predecessor. They also share the same seven-speed dual-clutch transmission. But while the retractable roof adds a little more than 100 pounds to the Spider, it can still match the coupe in rocketing from 0-to-60 mph in 2.8 seconds, harnessing 568 pound-feet of torque for a top speed of 212 mph (202 mph if the top is down.) McLaren clocked the Spider one-tenth of a second slower through the quarter-mile than the coupe. But you might just be willing to sacrifice the tenth of a second for the wow factor of a retractable hardtop that silently and smoothly opens or closes in only 11 seconds. For a few dollars more (okay, more like $10,000 more) you can even get an electrochromic glass roof that goes from clear to dark tint at the touch of a button. If cost is no barrier, McLaren Special Operations (MSO) bespoke division offers virtually unlimited customization. McLaren can create cars around an owner’s precise tastes and provide everything from bespoke customization options to building ultra-exclusive limited-edition or one-off models. The mission is to make what is already special into something truly unique to create the perfect McLaren for the owner. McLaren Dallas, located at 5300 Lemmon Avenue, is part of the Park Place Premier Collection, which also includes Maserati Dallas, Bentley Dallas and Rolls-Royce Motor Cars Dallas. Ken Schnitzer founded Park Place Dealerships in 1987 with a single Mercedes-Benz dealership on Oak Lawn. Today, Park Place Dealerships employs more than 2,000 people and operates 16 full-service dealerships representing luxury brands including Lexus, Mercedes-Benz, Porsche, Volvo, Jaguar, Lotus, Land Rover, Rolls-Royce, Bentley, McLaren, and Maserati. For more info, visit parkplace.com.